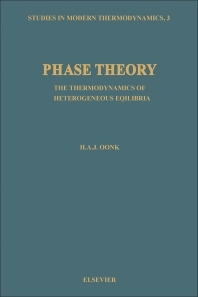 9.1 A "Van der Waals Analysis"
Studies in Modern Thermodynamics, 3: Phase Theory: The Thermodynamics of Heterogeneous Equilibria focuses on the processes, methodologies, principles, and approaches employed in the determination of the thermodynamics of heterogeneous equilibria. The publication first elaborates on thermodynamic background, phase rule, and general relations for binary equilibria. Discussions focus on linear contributions, G-curves and phase diagram, function changes, Clapeyron's equation, derivation of phase rule, pressure and temperature, heat capacity, enthalpy, and Gibbs energy. The manuscript then examines demixing, isothermal liquid-vapor equilibria, isobaric equilibria between two mixed states, and isobaric equilibria between unmixed solid and mixed liquid state. Topics include phase diagrams, pure solid component with liquid mixture, equilibrium between two ideal states, calculation of phase diagrams, and types of phase diagram. The text ponders on the interpretation of TX phase diagrams and retrograde equilibrium curves, including retrograde solubility, regions of demixing, excess parameters, and eutectic systems. The publication is a valuable reference for researchers wanting to dig deeper into the thermodynamics of heterogeneous equilibria.